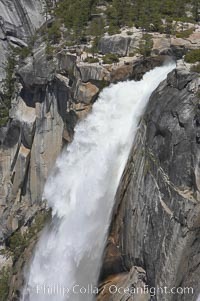 Nevada Falls plummets 600' (200m) through a joint in the narrow Little Yosemite Valley. It lies a few miles past Vernal Falls and is reached by the Mist Trail, a spectacular route along the Merced River from Yosemite Valley's Happy Isles, through the Little Yosemite Valley to Vernal Falls and beyond to Nevada Falls. The final 1/2 mile approach to Vernal Falls takes the lucky hiker up through green woods and then open switchbacks among granite bolders, close enough to the plume of the falls that the hiker gets a good sense of the power of the falls, especially during peak water flow in spring months. Once at the summit of the falls, one has a spectacular view from the Panorama Trail down Little Yosemite Valley and across to Glacier Point.